Head of School Professor Fabienne Mackay joined Biomedical Precinct leaders to meet with a French Government Delegation last month. 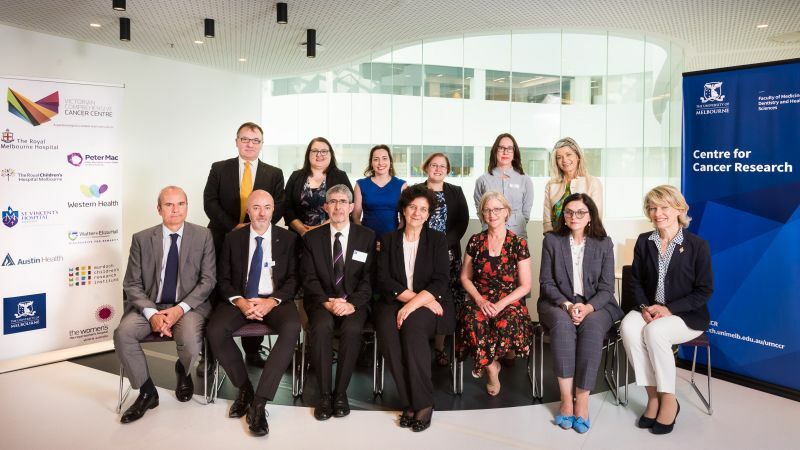 French Minister for Higher Education, Research and Innovation, Professor Frédérique Vidal, along with officials and scientists from France were welcomed to the University of Melbourne last month. The meeting, hosted by the University’s Centre for Cancer Research, focused on increasing health and medical research collaboration between the two countries. Joining the minister was Dr Gilles Bloch, CEO and Chair of the National Institute of Health and Medical Research (INSERM) and Thierry Damerval, Managing Director and Chair of the French National Research Agency (ANR). They met with health research leaders at the University from the Doherty Institute, Florey Institute and Faculty of Medicine, Dentistry and Health Sciences. Discussions showcased the success of existing partnerships, including the first French-Australian collaboration of its kind between the lab of Melbourne’s Associate Professor Frédéric Hollande, head of the Tumour Heterogeneity in Metastatic Cancer, and INSERM. Associate Professor Hollande congratulated the delegation for furthering the science and innovation relationship between France and Australia. “There is a huge appetite for formal, structured and supported collaboration from governing bodies between the two countries,” he said. Professor Mackay, who completed a PhD from Louis Pasteur University in Strasbourg in France, enjoyed speaking with Dr Bloch, CEO of INSERM – the NHMRC-equivalent in France. “He acknowledged the strength of research in neuroscience at the University of Melbourne and is keen to explore more collaboration in this area with us,” she said. READ MORE: Visit the Centre for Cancer Research.